I had just started writing that I really like this photo of Hannah and then realised that you’re probably wondering why she’s writing that about herself. But of course this time it’s not Hannah writing! So in our first Meet the Team Mondays post when Hannah interviewed me, she also wrote the story of how we met at a swim-run in Ta’ Qali in 2010. To tell the story from my point of view, I remember being really impressed by how strong this young athlete was not just in the run, but also in the swim. And we chatted afterwards and I remember telling her that I was sure one day she’d become a really strong triathlete. And what an understatement that was! 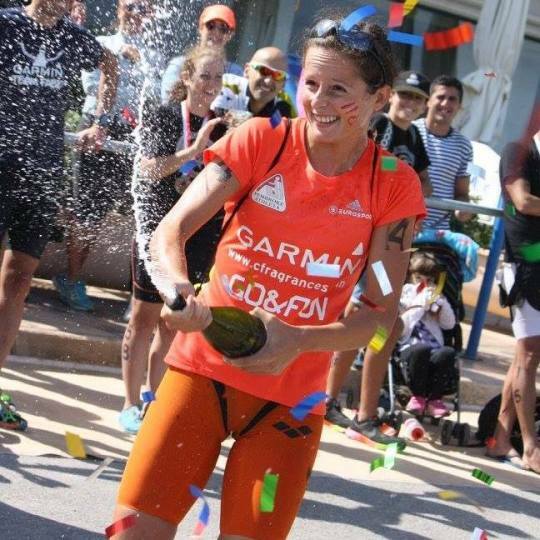 Hannah has gone on to become the first Maltese female triathlete to qualify for the IRONMAN 70.3 World Championship in Australia. She’s won more races than I can possibly mention here, including being crowned European Age Group Champion the first time she took part in the European Triathlon Championships in Turkey a few years ago! While we were in Turkey, she ended up packing my bike because I had a terrible migraine and wasn’t able to do it myself. In fact, notwithstanding all her success as a triathlete, it always amazes me how down to earth and caring Hannah is. 1) What’s it like balancing a full-time job with semi-professional training and racing? If you had asked me this a year ago, I would have said that it wasn’t possible to do both successfully. In retrospect, I now realise how much time I used to waste – knowing that I had all the time in the world. My job has made me realize that time is precious so I really try to make the most of it – somehow I also find time for a chat and coffee most mornings at the pool. It’s all about balance and time management – I usually plan my entire week on a Sunday afternoon (this also includes fitting in time for my family and friends too as I love going out ;)). It’s a strict schedule and I try to stick to it – the fact that people at work are so understanding and supportive has made things much easier for me too. Having said this, I’m not invincible and I do have my moments when I crash but I guess I’ve learnt to listen to my body more. 2) If you could choose to have been born in any country apart from Malta, which country would you choose and why? Hmm tough one, I like Malta don’t get me wrong but I guess I would have chosen somewhere with more mountains, lakes and just generally more open space to ‘run free’. Every year I spend a couple of weeks at a training camp and I really do feel like I’m living the dream so yeah France would be ideal :). The food, the wine, the countryside and the beaches – they have it all. Hehe they also have really long lunch breaks during work – i.e. more time to train. 3) What would friends describe as your best quality? And your worst one? Do you agree with both? If not, why? I’ll start with my worst because it’s always easier to criticise yourself. I would say that it’s definitely impatience, I tend to act rashly and often regret it afterwards. This is the same in sports, especially races, I tend to get hot-headed easily (much to the frustration of my extremely patient coach…). I’m getting better at this though (I promise). 4) When you’re not working or training, what do you usually get up to? Erm sleep and eat… No I actually do have a life outside of work and triathlon. I’m someone who has always been very close to my mother – we are almost best friends, so I tend to spend a lot of time with her and my boyfriend. We just got a kitten so he is taking up a lot of our time and energy too hehe. I also enjoy my food (if it isn’t obvious by now) so we tend to eat out quite a bit. I also go out a lot with friends at weekends as it’s my way of relaxing. 5) What things do you not like to do? If you asked my mum or boyfriend they would both answer the same – I HATE BUYING PACKS OF WATER. It’s a family joke because it’s just something that really ticks me off and I always manage to get out of it. Joking apart, I would say that the thing I dislike most is walking. Oh the irony, I’ll run 25km any day but 15 minutes of walking is my idea of a nightmare. 6) What was the best day of your life so far? You’re making them hard JOHANNA!!! I’ve had so many good days (including that time we were in Turkey together). I guess I’ll go with a recent one since it’s harder to think back to things that happened a long time ago. I would say a day which has really stuck in my head was just less than a year ago when I crossed the finish line at Ironman Budapest 70.3. It was my first try at this distance and I had never expected to do so well. My boyfriend was waiting for me at the line. Knowing I had so much support from home too, it was just an incredible day and it really left a mark on me. That day something clicked and it really changed me as an athlete, it’s difficult to explain but I managed to tap into a whole new level of suffering and it was actually ok.
7) What song best describes your life? Now this is an easy one because it’s one of my favourite songs at the moment. “No Worries” by Disciples and David Guetta – I’ve changed a lot in the last couple of years and this really does mimic my laidback attitude to things. I think Hannah’s answers sum her up really well: hard-working both in her work at MUHC and in her training, but always up for a fun time. She’s a great asset to our team and also a really great friend.